I’m well aware that posting a cold breakfast recipe in October, when it’s 45° and raining and you’re really craving warm comfort foods, is totally nonsensical but just hear me out. 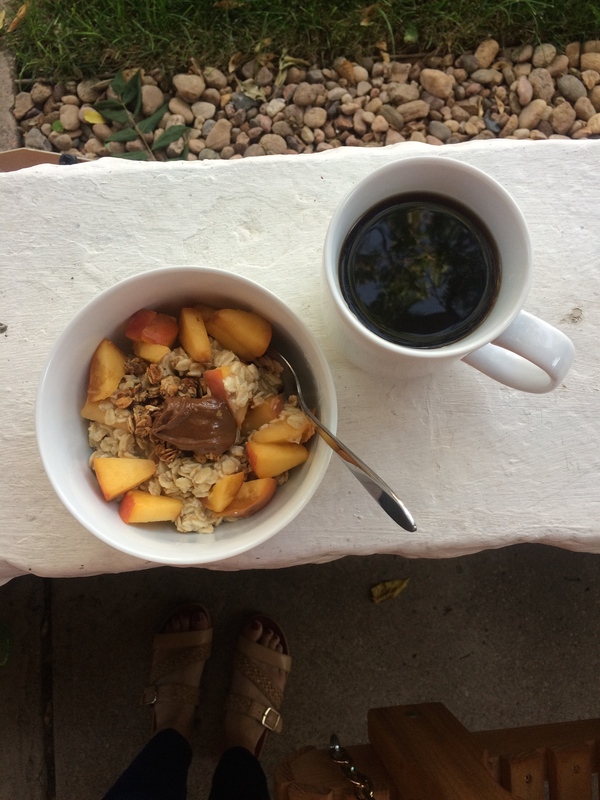 I fell in love with this breakfast this summer when we started half marathon training because, when you have to squeeze in 5 mile runs between sunrise and leaving on time for work, there’s actually NO TIME for any breakfasts that take longer than two minutes to prepare. The time it took for me to pull overnight oats from the fridge and throw some granola and peanut butter on top took less than two minutes, so it fit the bill. Post-half marathon training, I find myself still craving this breakfast because it’s so dang simple, delicious and customizable that the fact that it’s cold is a total non-issue. If I had to guess how many times I have eaten this for breakfast between the start of summer and now, I’d say it’s around the one million mark. A moment of silence for flip flop weather and the summertime vibes present in this picture. I’ve been eating overnight oats in some form since 2010 (is this what we call a long term relationship??) and while I’ve done the whole vegan with chia seeds thing and the non-vegan with Greek yogurt thing, it wasn’t until I saw one of my Bon Appétit Magazine Instagram follows post a version that was just straight up oats and milk that I realized that was even an option. Turns out this version is my favorite of all! No slimy chia seed texture and no tangy yogurt taste. Total win. My standard is 1/3 cup rolled oats + 1/3 cup unsweetened cashew milk + 1/2 a sliced banana, stirred and refrigerated overnight. In the morning I add a little extra milk or water and mix it all up before topping it with granola and peanut butter. For a fun fall rendition add 1/3 cup pumpkin and a generous drizzle of maple syrup!